As many of you already know, one of my favorite things about living and being in Oaxaca is, you just never know what you will stumble across. Rounding a corner, one might come upon a calenda (parade) with band, marmotas, monos, and dancers; a street artist or payaso (clown) entertaining a gathering of nin@s to abuel@s; street art; or a newly opened store. 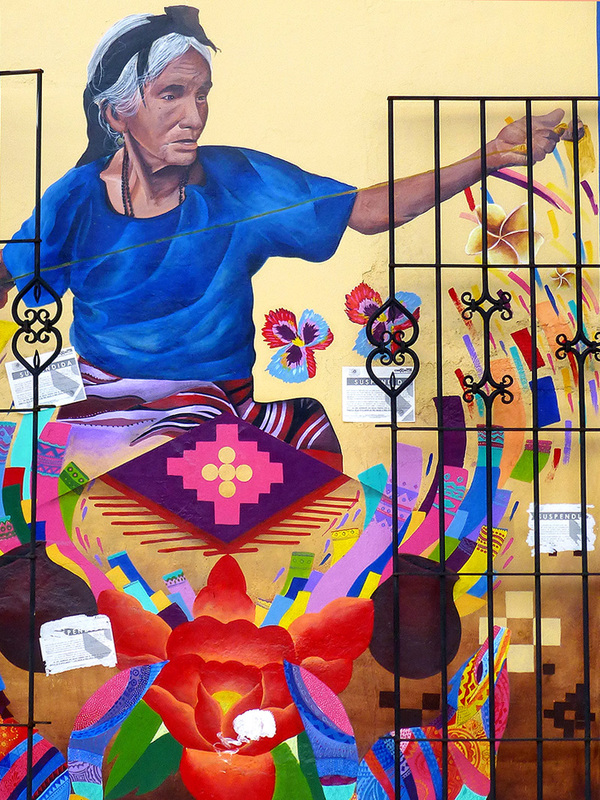 So (no surprise), a few months ago, walking up Tinoco y Palacios enroute to the Sanchez Pascuas mercado (in need of a few staples like quesillo, aguacates, and tamales), a stunning new mural caught my eye. Positioned to entice potential customers into Color y Cultura, a newly opened artisan community shop, the mural is the work of Chiquitraca Colectivo from Juchitán. It worked, I was hooked, and later returned to browse and eventually buy a pair of earrings carved from a gourd. However, during a return trip to the mercado, I was rather shocked to see unsightly papers defacing the mural. Usually, street murals are “hands off” zones for vandalism. 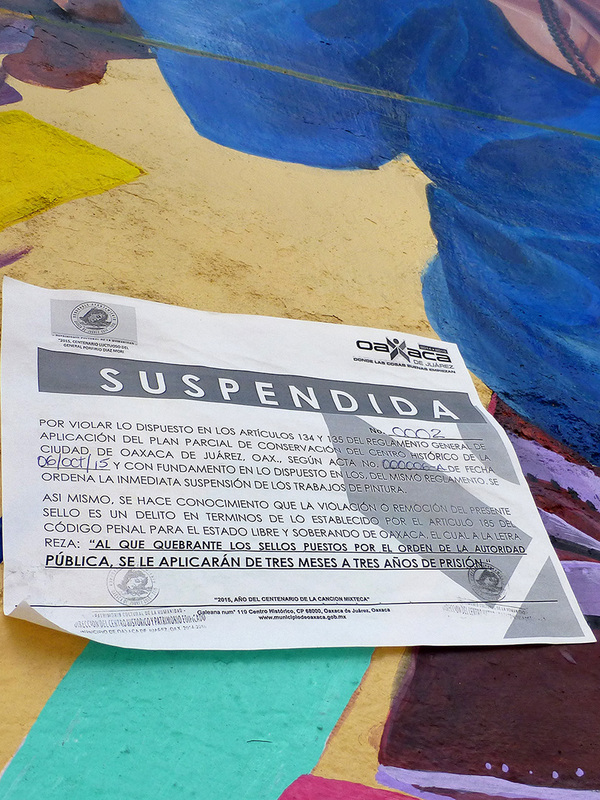 However, closer inspection revealed official notices declaring, “Suspendida” (suspended) and going on to say that the mural violates regulations on the conservation of the historic district. And, if this weren’t egregious enough, remember the stunning We sow dreams and harvest hope mural on the side of Museo Belber Jimenez? It too now has appalling “Suspendida” notices plastered on it. WTF is going on??? A little research revealed that a law was recently passed to “criminalize” wall art. Yes, yes, yes… I understand that the “powers that be” and even ordinary residents are sick of graffiti on historic buildings. BUT to lump the anarchist “A” spray-painted on the side of the Cathedral with magnificent murals painted on ugly decaying walls and beautiful works of art privately commissioned by businesses and museums to decorate their buildings, is the height of absurdity, never mind assigning a “criminal” aspect to it. Believe me, Oaxaca has a laundry list of more important issues that it needs to address. If in their “infinite wisdom” they are attempting to “clean up” the city to better appeal to tourist dollars, euros, yen, etc., then I think they are barking up the wrong tree — we extranjeros (foreigners) love the street art! To that end, below is a copy of a letter I sent to the president of Central Connecticut State University (CCSU) last year, when officially authorized murals painted by art students as part of their course work were ordered removed by the university administration. I am writing to you from the city of Oaxaca de Juárez in southern Mexico, nestled in the valley where corn was first cultivated. I have the privilege of living in culture that has a deep respect for, and appreciation of, communication through all forms of art. 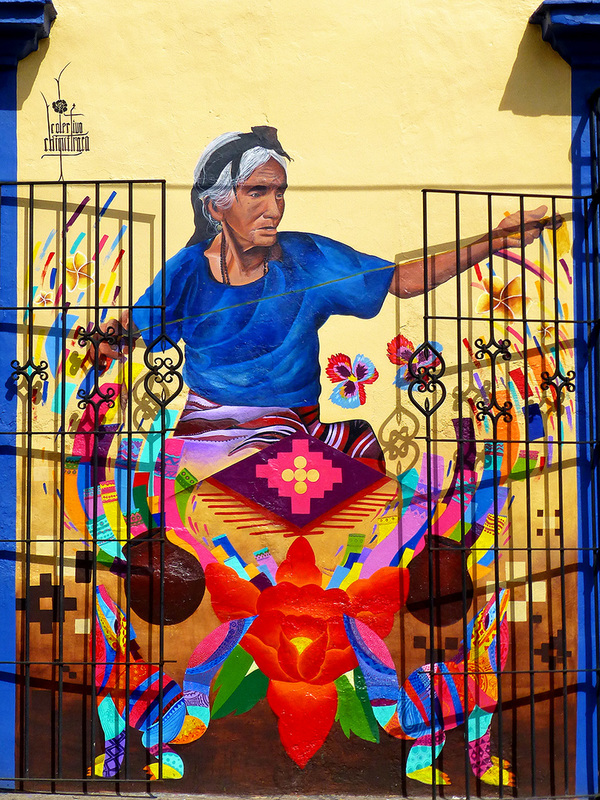 Oaxaca is filled with museums and public art. In addition, her walls are covered with murals, both officially sanctioned and unauthorized. An example of the latter: My current neighbor, previously lived next to a concrete bench built into a wall along her street. It’s primary function seemed to serve as a gathering place for garbage and graffiti. Being an artist, she painted a living room scene around the bench, replete with, a lamp, bouquets of flowers, pillows on the sofa/bench, and a framed painting with the image of a smiling creature holding a sign that quotes Oaxaca’s favorite son and former Mexican president, Benito Juárez: “El respecto al derecho ajeno es la paz.” (Respect for the rights of others is peace.) 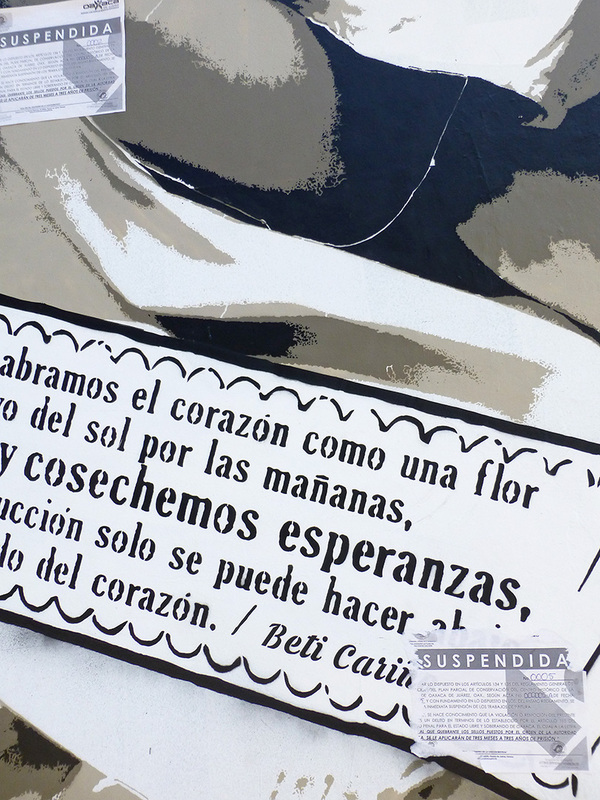 It is a quote that every Mexican school child learns and in the eighteen years since the bench and mural were first painted, it has become a beloved icon of the street and very little graffiti and garbage have reappeared. Oaxaca would lose much of her character and lessons would be lost, if we were to wake one morning and find all her murals disappeared. The story is the same at CCSU and it would be shameful if the beautiful and thought-provoking student murals at CCSU were to be needlessly destroyed. 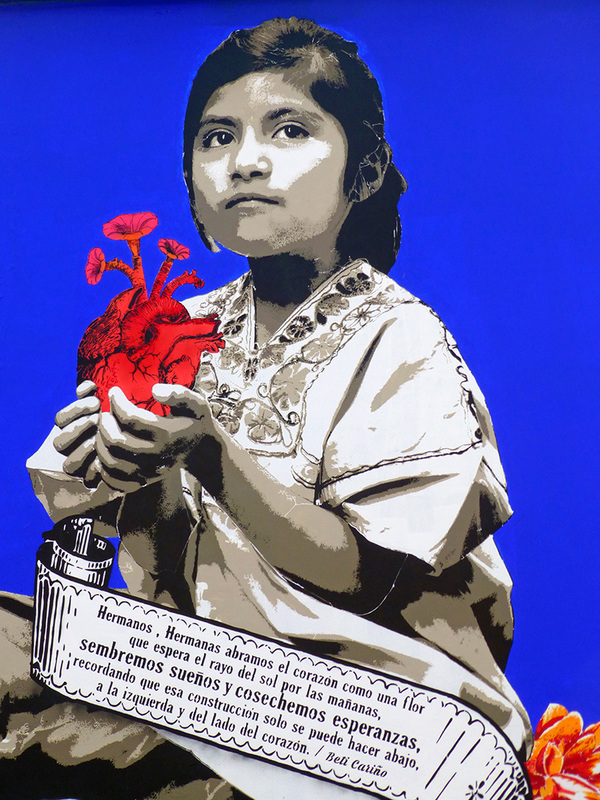 It is a sad day indeed, when wall art is banned/criminalized in Oaxaca! I love wandering the streets taking photographs of newly discovered art. I love the fact that people have an outlet for the issues burning in their souls. “Graffiti” shows the heart of the city…..
What will they ban next? Parades of protest and solidarity? Sad… But is the crackdown on street art being made to keep the historic city center in compliance with the UNESCO designation? I believe that is why San Miguel de Allende restricts wall art within its qualifying boundaries. (Or is it a convenient excuse?) I think in San Antonio’s historic districts there has been some relaxation on house colors, as the city was embarrassed by author Sandra Cisneros’ prolonged high-profile battle to keep her former house purple. The governing philosophy is more along the lines of: “Don’t faint; it’s only paint.” Seems as though that should apply to street art…. There’s no permanent damage to the historical integrity of the structures. I really don’t know… Murals and street art have been a part of the culture of the city for a long time. However, I think there is a wing of the elite that would like to purge the city of any evidence of the “great unwashed masses” and turn it into a sterile Disneyland. A sad day indeed , especially for the amazing artists that will have their wonderful, soul reaching art covered up!!! Definitely a mistake …people love street art of this caliber. I will be very sad to see it gone! We drove down T&P yesterday and I didn’t see the Color y Cultura mural. I need to walk up there and see if it has been painted over. It makes me sick to think this might be the case.